Calling on any readers with experience on composting. 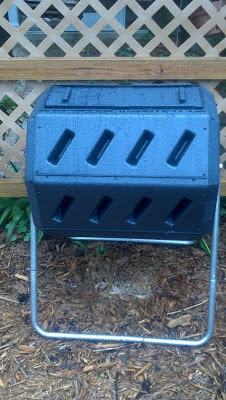 This is my new compost bin. We only have kitchen waste for two eaters and I thought it would be plenty large enough. There are an A and B side to the bin and you alternate filling and cooking/marinating. Another feature I really like is you just spin the tumbler no shoveling of the contents. My questions are, what is up with all of those gnats are they part of the composting process? How long does it take to complete a batch of material? If I put weeds in with the kitchen scraps then spread the mulch will I be spreading weeds? The only information the composter came with was directions on odor and the balance of greens/yard trimmings to kitchen waste. Any experience you might like to share would be welcomed. Kitchen scraps often have fruit fly eggs. If you hard-freeze or microwave the scraps before tossing them into the composter, it will kill them. However, once you have the flies in your compost, they will repopulate. I pretty much ignore them if they are outside and they will eventually ebb. At that point adding only scraps that are free of living eggs will help avoid the problem in the future. While the theory of composting is that the heat will kill weed seeds, there are always survivors! I cannot bring myself to throw away good organic material, yet I do not want to sow weeds throughout my garden. I have a couple of methods that have worked well for controlling weed seeds in my compost. One is that I throw my weeds into an old cooler I use just for this purpose, and pour boiling water over them. I close the cooler and it cooks the weeds thoroughly. Then I can safely throw them into my compost. Another method I use is to put them in an empty raised bed that I cover with a large window we have. The glass intensifies the sun and holds the heat in. That method also effectively cooks the weeds thoroughly before tossing them into my compost. Finally, you want to balance your compost between nitrogen rich and carbon rich materials. Most kitchen scraps will be nitrogen rich, as will lawn clippings. Dead leaves, straw, and other "crunchy" material are a good source of cabon rich material. I found that adding the straw I pull out of the chicken run and adding it to the "green" material in my composter really accelerated the decomposition process. 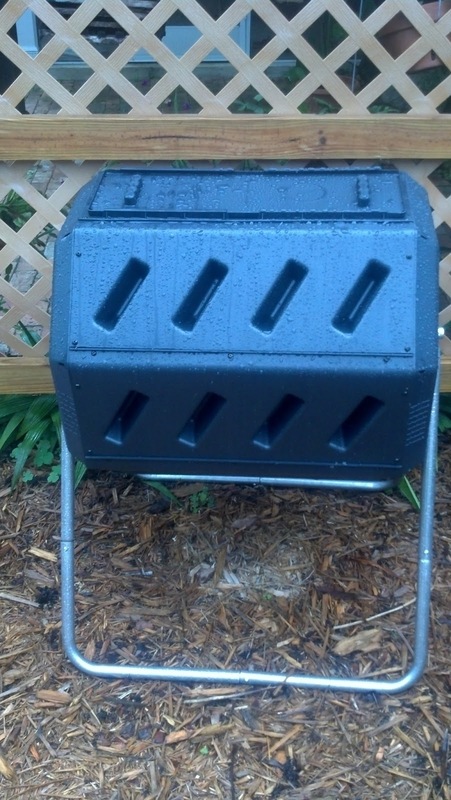 I would love to say I can compost a batch in the three weeks the adds for fancy composters boast, but in reality, It can take 3-4 months to get a really good break down during the cold months and couple of months during the summer. Even then, there will be some twiggy residue from the carbon rich material. It may go faster if I was good about turning the composter three times a week, but since I work long hours at my job, it tends to get turned on the weekends. I truly appreciate the information. Looks like I have to make some changes. I can tell you the fruit flies have opened a spa in our composter and by the looks of all the attendees there is a big discount too. We seem to have quite a lot of vegetable scraps and not so much nitrogen rich balancing material. We will have to work on that. I love the idea of the boiling water and the cooler. Harley is a contractor and always removing old windows from people’s homes maybe I will try the window solution first. Our yard is not that large but weeds are a popular form of green and I would love to have less not more. Great information, I am thrilled with these suggestions. I love composting! I found that watering, mixing & time are a key. It should take about one season to complete a batch if you have watered, but not over watered. I put everything (grass clippings, weeds, leaves, coffee grounds, banana peels, egg shells, etc, etc) in the compost pile except cooked foods & I add the dirt from old flower pots. It sort of takes care of itself. Over time you will see the "black gold" at the bottom of the pile. It's good to have the bugs & worms in the pile too. We put a wire & wood frame right on the ground so the bugs & worms come right in. Have fun & be patient. It just seems right to recycle the natural vegetation we produce and not send it to the landfill. I believe we were meant to be farmers of some sort we both just love the land. Many of our vacation photos have me next to a tree hugging it and I consider flowers to be the eye candy of the Universe. Until I put all of our vegetable peelings, egg shells, and coffee grounds in one pile I had no idea how much debris we had. I think I am going to take your suggestion and put a frame on the ground so the worms can get in and out and do their valuable work. What I have selected is just too small. These tips just make sense thank you for taking time to help us as we get started.